This article is about the world in Kingdom Hearts II. You may be looking for the world in Kingdom Hearts 3D: Dream Drop Distance or the manga chapter. Space Paranoids is a world that appears in Kingdom Hearts II. It is entirely contained within Hollow Bastion's computer system. It is based on the Disney movie Tron, and is named after the video game created by Kevin Flynn in the movie. Along with being one of three worlds in the series that are contained entirely within another world, it is also one of two worlds to be based on the Tron franchise, the other being The Grid. Space Paranoids is unlocked upon the second visit to Hollow Bastion. The world is inaccessible by Gummi Ship; instead, the player must access the computer in Ansem's Study to enter it. When first brought to the digital world, Sora, Goofy, and Donald are promptly arrested by Sark and taken to the Pit Cell (ピットセル, Pitto Seru? ), where Tron is being held prisoner by the Master Control Program; this room also hosts the Moogle Shop. After Tron explains the situation, the party escapes the Cell, heading for the Canyon (キャニオン, Kyanion? ), where they play a mini-game to unlock the terminal access. Further along and to the right is the Dataspace (データエリア, Dēta Eria?, lit. "Data Area"), where the DTD can be accessed. Sora is forced to play Light Cycle on the Game Grid (ゲーム盤, Gēmu-ban?, lit. "Game Board"), a vast arena with a dark blue floor gridded with glowing light blue accents. Crossing the canyon leads to the I/O Tower: Hallway (入出力タワー:ホール, Nyūshutsuryoku Tawā: Hōru?, lit. "Input and Output Tower: Hall"). Heading right takes the group to the I/O Tower: Communications Room (入出力タワー:通信室, Nyūshutsuryoku Tawā: Tsūshin-shitsu?, lit. "Input and Output Tower: Telecommunications Room"), while going left takes them to the Simulation Hanger (ソーラー船ドック, Sōrā-sen Dokku?, lit. "Solar Ship Dock"), where the Solar Sailer Simulation (ソーラー船, Sōrā-sen?, lit. "Solar Ship") can be accessed. The Simulation takes the party to the Central Computer Mesa (システム中枢外部, Shisutemu Chūsū Gaibu?, lit. "Central System Externals"), which is the area just before the MCP's headquarters, the Central Computer Core (システム中枢, Shisutemu Chūsū?, lit. "Central System"). 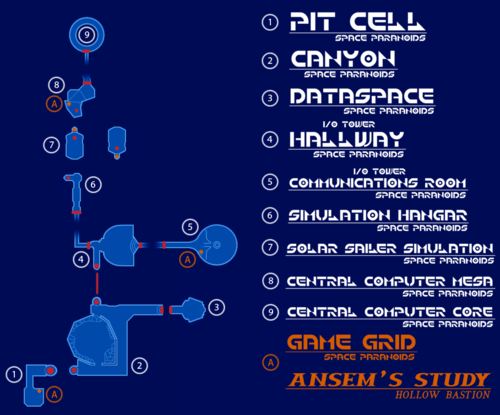 Long ago, Ansem the Wise copied a computer system created by ENCOM for his own computer system and renamed it Hollow Bastion OS, creating Space Paranoids. It was to be used for Radiant Garden's town maintenance and his personal research. However, after exiling Ansem and posing as his mentor, Xehanort altered the system, reintroducing the Master Control Program, or MCP, and Sark from the original system. The dataspace, where all the system's original data was stored, was named the DTD, after the Door to Darkness, and could be accessed by a password made up from the names of the seven Princesses of Heart. During his second visit to Hollow Bastion, Sora learns from Cid and Yuffie that they have found the computer of Ansem the Wise. Wishing to use it to find any information on the Organization, Kairi and Riku, or the King, Sora heads towards the castle. Upon finding the computer, Sora roughly types on the keyboard, vainly searching for information. While doing so, Goofy notices a blue creature on the ceiling. The creature falls onto the keyboard, and Donald jumps after him. As Donald jumps around on the keyboard, the erroneous keystrokes alert the MCP, who warns the party not to further misuse the console. While trying to get off the keyboard, Donald accidentally steps on more keys, resulting in the party being "arrested" and transported into Space Paranoids. When the gang arrives in Space Paranoids, they meet Sark, who sends them to a cybernetic prison: the Pit Cell. Here, they find Tron locked up as well; he explains where they are, and his plans to stop the MCP. The two join forces, and escape. Venturing into the Canyon, Sora restores the energy core system, activating the terminal that can send the gang back to Hollow Bastion. Before they leave, Tron tells them that they need the password for the DTD to access the data files. Sora learns the password in Ansem's study - the names of the Seven Princesses of Heart - and returns to Space Paranoids. Before meeting Tron, Sora and company are forced to play on Sark's Game Grid. After a few light-cycling games, they manage to escape and meet up with Tron. The gang then go to the Dataspace and insert the password, restoring Tron's functions. However, once access is gained, the MCP gains access to the entire system and attempts to activate Hollow Bastion's emergency self-destruct. Tron hacks into the system and changes the password to the names of Sora, Donald, and Goofy. They then depart to the I/O Tower, where the MCP means to upload the Hostile Program to the town. After defeating the program, Tron uses the terminal in the tower to return the trio to the outside world. Back in Ansem's lab, they learn that the data files in the DTD have become corrupt. With Space Paranoids at peace, Sora, Donald, and Goofy attend to matters in Hollow Bastion. Some time later, the MCP manages to take control of the town's defense systems and the Heartless Manufacturer in Ansem's lab. Sora arrives on the world in the midst of an attack by data-based Heartless, with the Claymores now turned against him. Meeting his friends, he learns that they are working on a program that would eradicate the MCP with a combination of code and Merlin's magic. Having lost contact with Tron from the outside, Sora and Co. enter Space Paranoids once more. They find Tron on the Game Grid, swarmed by an army of Heartless. Defeating them and escaping the Game Grid, Tron reveals that the MCP is preparing to launch an all-out war on the User world. Sora reveals that his friends have created the "MCP Eradication Program," and the group travel to the I/O Tower to save the data onto Tron's Identity Disk. They board a Solar Sailer waiting for them outside the tower and head towards the MPC. During the flight, waves of Heartless sent by the MCP attack the quartet, causing the Solar Sailer to overload and begin to fall off its beam, but Sora fends them off. Arriving at the Central Computer Mesa, they face off against Sark and quickly eliminate him. In an attempt to defend himself from the eradication program, the MCP gives all his functions to Sark, causing him to enlarge and attack Sora and Co. once more. Regardless, Sora and Tron are able to use the program on the MCP and erase him from the system. After the battle, Tron suddenly starts acting cheerful, causing Sora to remark that he has a silly side; Yuffie later blames his personality change on Tron "hanging out with the trio too much." Before Sora, Donald, and Goofy leave, Tron says goodbye with a hug to each of his friends, each promising to see each other again one day, before jumping into the core where the MCP once stood. Sora, Donald and Goofy exit the system, where it is revealed that the Heartless invasion has stopped. As they try to explain on what happened, Tron suddenly speaks to them, now in control of the Hollow Bastion OS. He then shows what the town used to be like before it was destroyed, leading everybody to remember the true name of the town: Radiant Garden. In Space Paranoids, Sora, Donald, and Goofy are converted into data and change forms accordingly. Their physical features turn to grayscale, and their clothing is replaced by gray armor and outfits, accented with lines of glowing cyan. When Sora changes into his Drive Forms, the circuit patterns on his outfit alter color to match according to the form: they will change to red for Valor Form, blue for Wisdom Form, yellow for Master Form, white for Final Form, black/purple for AntiForm, and the circuits follow the colors of the Kingdom Hearts outfit for Limit Form: silver torso, red pants and yellow shoes. Sora in his Space Paranoids armor. Donald in his Space Paranoids armor. Goofy in his Space Paranoids armor. 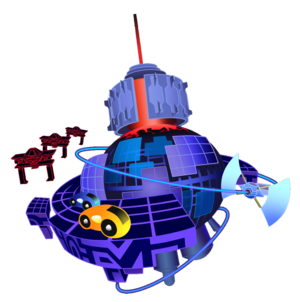 The world-icon for Space Paranoids features several Recognizers pursuing a pair of Light Cycles, portraying a scene in the film where Kevin Flynn, Ram and Tron escape the Game Grid. No Recognizers appear in Kingdom Hearts II outside of the world-icon, although they appear in The Grid in Kingdom Hearts 3D: Dream Drop Distance. Tetsuya Nomura originally intended for Space Paranoids to return in Kingdom Hearts 3D: Dream Drop Distance as part of Sora's story, while The Grid was only meant to be for Riku, though Nomura eventually scrapped the idea and used The Grid for both characters. Though Tron claims that the original ENCOM system was deleted, Xemnas states that the original data of that system has become The Grid. ↑ Xemnas: "Once, my master, Ansem, found an old system and made a copy of its Master Control Program...and used it to serve his own ends. This is the original data of that system." This page was last edited on 6 September 2018, at 21:49.